These quotes about family will remind you of the importance of the family unit. Can you imagine life without a family? You may find new friends, new love, new beginnings in your life; but your brothers, sisters and parents cannot be replaced. Be it your sweet wife, your dutiful and reassuring husband, the charming little princess, the always protective and caring mother or your friend and philosopher father – family is a place where you can enjoy true happiness, worldly comfort and a deep sense of belonging. Children, less fortunate and parents, grown their full age often are pushed to a situation where they stay without their family. While some may have got a taste of being together for quite a while, there are many who have not yet got a chance. It is time to give back something to your family to spread the love and happiness. Here are some wonderful and touching quotes to share with your family to capture those moments of warmth, fun, care, trust and affection and express your love for them. What is in life if it is without a laughter. Be it laughing at our own selves or about something funny regarding your family, laughter rejuvenates a streak of positive energy and boosts the immune system and leaves you stress free. Here are some funny family quotes that can surely leave you laugh. 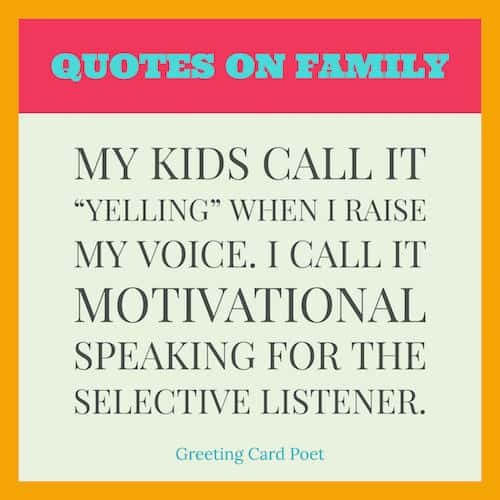 My kids call it “Yelling” when I raise my voice. I call it motivational speaking for the selective listener. 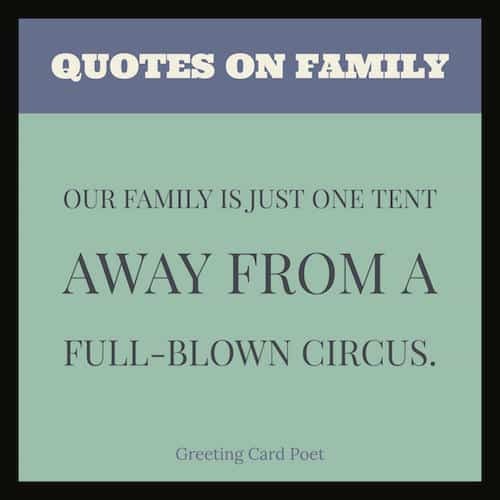 Our family is just one tent away from a full-blown circus. Insanity is hereditary: You can get it from your children. 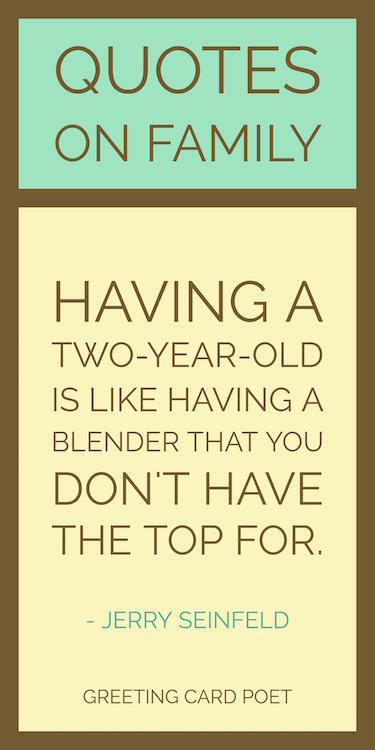 Having a two-year-old is like having a blender that you don’t have the top for. Never let an angry sister comb your hair. You might like Best Mother Daughter Quotes. A family is a gift of God and it is important to thank Him for this wonderful gift. In this section, you’ll come across some quotes that is in acknowledgement of the gift you have received. To appreciate and be thankful to Him for making you fortunate to have a family is the essence that comes out through these quotes. The greedy bring ruin to their households, but the one who hates bribes will live. Love the people who God gave you because he will need them back one day. Check out: Michelle Obama Quotes on Family. 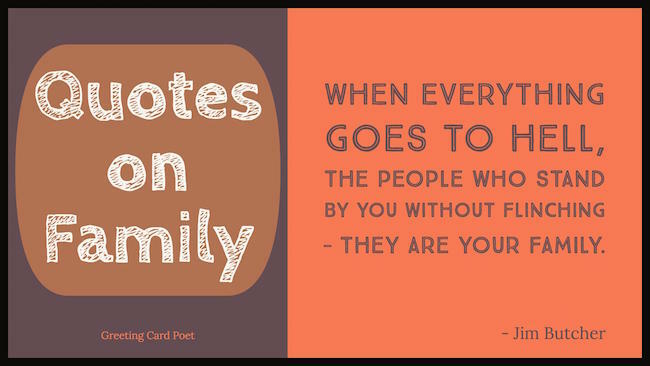 Tip: These quotes about family make great photo captions for social media and scrapbooking. Family can mean different for different people. For some of you it is a place where you can go back after a long day and relax in the kindness of loved ones. For some, it is a place which feels of your own and you don’t feel like hiding anything from your home. Here is a list of short family quotes that going to make you remember how important you are for your family. My circle is small but the love is enormous + genuine. it gets no better. A mother’s love for her child is like nothing else in the world. It knows no aw, no pity, it dares all things and crushes down remorselessly all that stands in its path. Children are a poor man’s riches. An ounce of blood is worth a pound of friendship. A crab walks so walks his children. Blended families or often known as joint families come with various unique challenges. While there are situations of chaos and over parenting with elders stepping into the role, there are also moments of fun and sharing with children of your age around you all through the day. Here is a short collection of quotes uniquely describing the segment of blended families. There is no doubt that it is around the family and the home that all the greatest virtues…are created, strengthened and maintained. Family is the most comfortable and dependable place on the earth and will always be the most dependable apart in your heart. Every member in the family – Dad, Mom, and children – sacrifices some of their wishes to varying extent in order to make you feel secure. They shower all the unconditional love no matter how you are at home, and at times may show you the good path to walk along. In a family, brothers, sisters and parents share the good times and the paid. Family members can be the first to praise and the first to forgive. First and most important of the powerful forces at work is the family. You leave home to seek your fortune and when you get it, you ho home and share it with your family. You’re on Quotes About Family page.